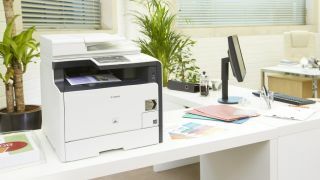 Workers are reluctant to use devices with remote printing and copying functionality away from the office, despite finding it beneficial to their productivity, a new study has found. The independent report, which was carried out by RS Consulting on behalf of Canon, surveyed 1,671 end-users and 300 decision makers from Europe. A further 60 in-depth telephone interviews were conducted with end-users from 12 countries. It found that 55% of respondents do not see the value in mobile printing opportunities at a client's site or public place, compared with 37% that do. Canon has identified four barriers that prevent remote working from being more widely adopted. Security was found to be the most common, with remote workers granted access to specific parts of servers that contain non-sensitive documents. The second, ignorance, found that many users are unaware of solutions available and their benefits. The report found that the concept of remote working is new to some employees, as is the concept of printing remotely. Lack of trust in the technology was another barrier, with some employees raising concerns about technology working consistently, or how they would cope with malfunctions 'on the spot'. Finally, the report found that some employees would feel obliged to do extra work outside office hours. According to the research, only a quarter of respondents feel they understand the full capabilities of their office equipment and are fearful of embracing the technology fully as a result of such uncertainty. "Generally, end users don't know what they can or can't do remotely," Matt Wrighton, European & UK marketing manager at Canon Europe, told TechRadar Pro. "Even when tech is implemented there is not necessarily enough education to understand what they can do, or what policies allow them to do, so education in this area is crucial." He added: "We recommend that businesses review their current document policies. There is a need to involve end users in that process, as they're the people in those workflows that understand what they're trying to achieve with documents."